I know I haven't posted in a while. Today, I'd like to share a little change of pace with you. I am slowly working on a Frisian coursebook meant for English-speakers. It is on the immersive side and immediately gives full examples of language usage. However, the highlighted terms in boxes are meant to be the active focus when starting out. Anyways, here's a small excerpt from my current draft. I'm in the beginning stages of this project and am not sure where it will go yet. Please do not redistribute this lesson draft without first obtaining my consent. Links back to this blog, however, are always fine and very much welcome! Ik wenje yn in lyts doarp. Us doarp leit yn it hert fan Fryslân. 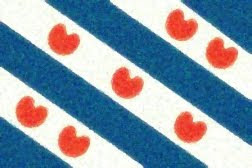 Our town lies in the heart of Friesland. Ljouwert is in grutte stêd. Ljouwert (Dutch: Leeuwarden) is a big city. Harns (Dutch: Harlingen) is a port city on the coast. *The 'e is a shortened form of de which you will often see in Frisian writing. Are you happy with your city? He is happy with the roads between the city and the sea. De dyk is wer iepen foar alle ferkear. The road is again open for all traffic. Mar de dyk is net gefaarlik foar fytsers. But the road is not dangerous for cyclists. *Bicyclists are very common in the Netherlands and often have paths of their own on the roads marked with red pavement. Singular: de fytser, the bicyclist, [DUH FEET-suhr].